You might have noticed I was pretty absent last week. I took a trip for the week and spent some time away from the computer and with my grandparents in Florida. It was a fun trip, though not particularly productive from a blogging or crafting standpoint! One of the good things that did come out of the trip is that I got to catch up on some reading. I picked up my copy of Crafty Superstar by Grace Dobush while on my trip and finished it on the plane ride home. It’s a fairly quick read, but chock full of useful information about how to become, of course, a Crafty Superstar. I’ve been looking forward to reading this book because it has a strong focus on what it takes to be a part-time crafter while still working a “regular” job. While I strongly desire to take my crafting to the next level, I’m just not there quite yet, though this book makes me feel better about the fact that I haven’t yet taken the leap. Many crafty business related books specifically focus on what is required to make the jump into full time crafting, and Grace Dobush makes you feel good about the decision to keep your day job. She spent time interviewing lots of “part-time” crafters who may seem to be dedicating all their time to craft, yet still have a “regular” job. Some of the crafters who contributed to the book include Olivera Bratch, owner of Wholly Craft in Columbus, Ohio; Faith Levine, director of Handmade Nation; and Jenny Hart, founder of Sublime Stitching. With so many similar books hitting the shelves lately, you might wonder why to pick this one up. Enjoyably, Crafty Superstar is a compact, tote-able book. 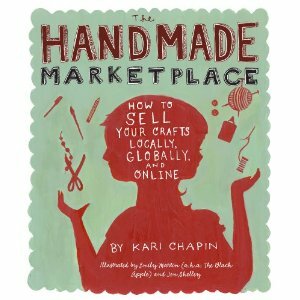 It’s got 6 chapters and a great appendix full of forms, templates, and list after list of online resources for crafters. 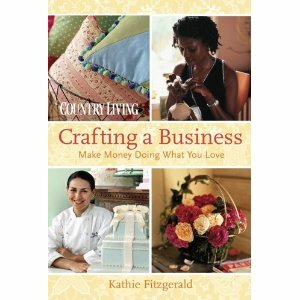 In chapter one Grace covers the basics about DIY and gets into detail about what being an “indie” crafter is all about. More detailed business advice is the focus of the rest of the book, and the author covers things from where to sell (internet, brick and mortar, craft fair), how to prepare for craft fairs, how to get good press for your business, and most uniquely, how to find balance between your personal life and your crafting life. Right away I realized this book was going to need to be read with a pen handy for marking important things as I went along. The book also has quizzes and checklists throughout, so having a pen handy means you’ll be more likely to work along as you read. I found so many helpful tips I hadn’t thought of before, or that were presented to me in a new way from other books that cover the same topic. I really enjoyed all the real pictures from Wholly Craft, and pictures of super well designed websites, as well as the focus on product display at stores, booth display for fairs (I’m already giving mine some new considerations), and I especially enjoyed the section about packaging design because this is something I have been personally working on a lot lately. One of the biggest things to hit home for me was breakdown of cost of product and product pricing. Grace takes the time to break down penny by penny the cost to list an item on Etsy (FEE), sell it on Etsy (FEE), get paid through PayPal (FEE), and ship your product out. While this is something I probably should’ve done for myself, I haven’t. Wow did this open my eyes! Other helpful tips include how to build your own light box for taking good photos, and how to promote yourself to the fullest. Additionally, besides Grace’s fantastic advise, there is long list of new sites I need to visit from the amazing list of contributors. If you’re thinking about kicking your craft business up a notch and are looking for some straight forward, well written advise, I highly suggest you go get yourself a copy of Crafty Superstar. I promise you will find yourself flipping back through the pages again and again as you work your way toward becoming the craft maven we all know you want to be! If you’ve already read Craft Superstar, please let me know your thoughts on the book and what you found most helpful! For those of you rushing out to buy it now, happy reading! And don’t forget to come back and tell me what you think!